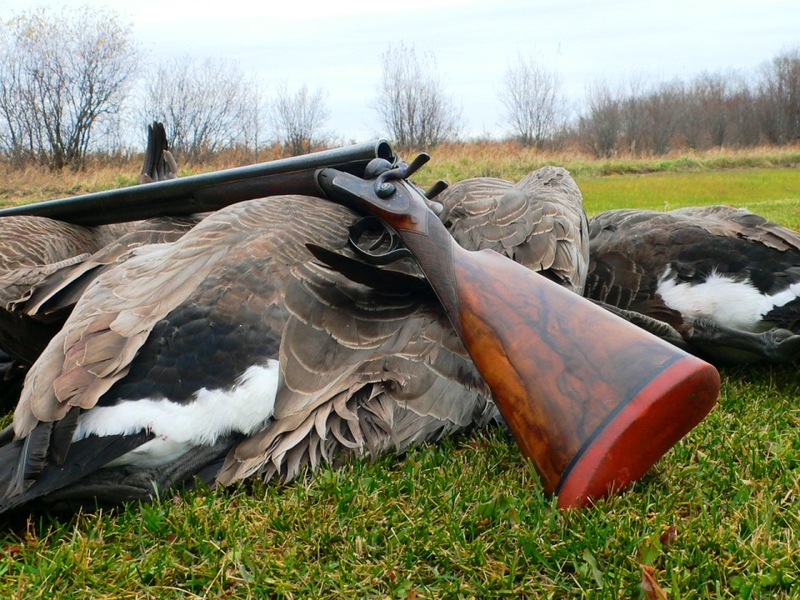 Though it depends on where you hunt, waterfowling can be cold and wet. Very cold and very wet. Those who prefer semi-autos in the blind often lean toward inertia actions, as opposed to gas actions, because they seem to function well when frozen or soaking. That’s one of the reasons that Benelli autos, like the Super Black Eagle III (reviewed here a year ago), are so popular. Franchi and Stoeger—owned by Beretta, as is Benelli—also produce popular short-recoil, inertia-operated guns using the Benelli Inertia Driven action. Another option is the A5 Browning Kinematic short-recoil inertia action, which replaced the long-recoil action of the old Auto-5 humpback in 2014. But Europe isn’t the only place to make an inertia-actioned shotgun. Retay Arms, founded in 2006 in Konya, in central Turkey, produces a new inertia semi-auto with some advanced features at an attractive price. It is called the Masai Mara, after the national game reserve in Kenya. It is imported into the US by the upscale Thomas Ferney & Co., in Gaithersburg, Maryland. 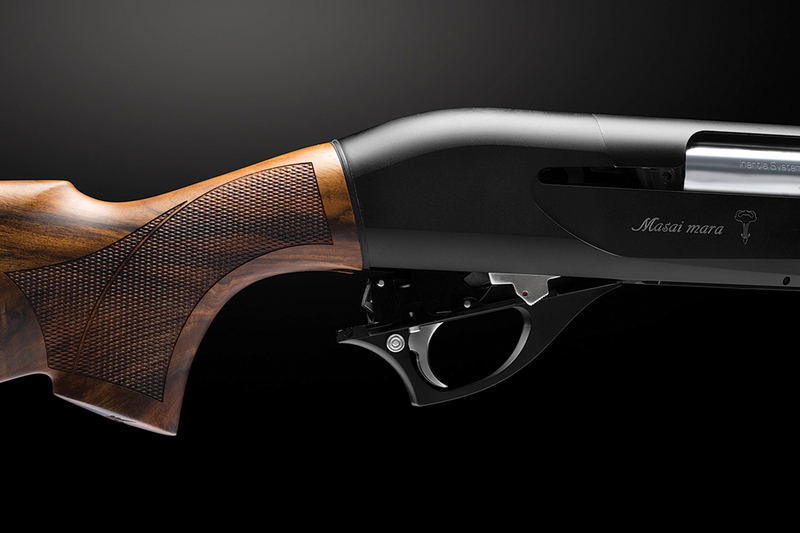 The Retay Masai Mara inertia shotgun comes in 16 models, all of which use the Retay Inertia Plus action and differ only in stock material and exterior finish. Only a 3″ 12-gauge is made at this time, but I’d be surprised not to see a 3½” 12 and a 20 down the road. The price range is $799 for the basic black synthetic model to $949 for the synthetic-stocked gun in camo to $1,095 for the gun with a wooden stock. The receivers also come in different colors and Cerakote finishes. Our review gun is the top-of-the-line Masai Mara with a jet-black receiver and figured wood for $1,095. This compares to $559 for a Stoeger 3000, $789 for a Franchi Affinity 3 and $1,129 for a Benelli Montefeltro—for the least-expensive models in each line. The Masai Mara action is much like the classic Bruno Civolani action in the Benelli, but changes have been made. Basically, the Civolani short-recoil inertia action is built around a two-piece bolt and spring. The front rotating bolt head locks into the barrel. The main bolt body is free-floating. The spring sits between the two. On firing, the entire gun except for the free-floating bolt body moves rearward. The bolt body stays put for a moment due to inertia. With the bolt body stationary and the gun moving back, the stout inertia spring is compressed. As the shot leaves the barrel and recoil lessens, the spring expands, unlocking the rotating bolt head and pushing the bolt body rearward, ejecting the empty shell and recocking the hammer. Then the secondary spring in the stock takes over and pushes the bolt back into place as the lifter raises a new shell to the chamber. The biggest change that Retay has made is its Inertia Plus modification. With the original Civolani action—still used by Stoeger, Franchi and most Benelli models—if the bolt is closed slowly by hand to avoid noise, it sometimes will fail to lock and there will be only a “click” and no discharge when the trigger is pulled. The more expensive (about $2,000) Benelli Ethos and Super Black Eagles have changes that have dealt with this issue, but the other models have not. The Masai Mara’s Inertia Plus locking system cures this and allows you to ease the bolt home by hand and still have the gun fire properly. Like many autoloaders’ receivers, the Masai Mara’s is a high-strength aluminum alloy, but unlike much of the competition, the trigger assembly is also aluminum, not plastic. And this Retay gun has another little trick. The trigger assembly is removable by just pushing in a button, as opposed to other guns that require you to drive out one or two cross pins. This makes things a bit easier to clean and oil. The trigger on our gun had a 5¼-pound pull with a little smooth creep before release. It was perfectly satisfactory for hunting. The manual crossbolt safety, behind the trigger, is reversible for lefties. Currently barrels come in lengths of 24″, 26″, 28″ and 30″. Our test gun had 28″ barrels. The interiors of the barrels are chromed for ease of cleaning and resistance to scratching. The barrels are proofed at 1,500 BAR, a pressure well above the norm. The forcing cone was longish at 1½”, while the bore was .724″. That was a typical bore size before the overbore craze enlarged things. Five 2¾” Marapro chokes are included. They are flush mounted, as is appropriate on a field gun. The choke interiors are tapered to within ½” of the muzzle, where they run parallel to stabilize the shot. Constrictions of the Full (.035″), Improved Modified (.027″) and Modified (.019″) were just about dead on conventional constrictions; but the Improved Cylinder (.002″) was much more open than the usual .010″, and the choke labeled “S” measured an overbore .730″, for a negative .006″ constriction and cylinder-bore performance. The barrel has been OK’d for steel shot with all of the chokes except the IM and F. Choke designations are conveniently marked on the sides of the choke bodies and also via rim notches. Choke rims are cut to accept the nice included choke wrench. The wrench also has a threaded end for cleaning out the barrel’s choke threads, if they carbon up. The barrel has one other novel touch. The common ejector stud that deflects the spent shell from the port is a separate piece and is removable and replaceable. In many other autos it is a simple stamping. The exterior of the barrel was nicely blued. It was blessedly free of a noticeable muzzle bulge where the chokes fit. The 8mm (.31″) top rib is delightfully low and flat—perfect for the field or blind. It will not intrude on your shooting. There is no useless center bead, and the front bead is a small Tru-Glo red sight. The modest weight and correct balance made the gun easy to shoot. As mentioned, the receiver on our gun was solid black, and there was no engraving save for the words “Masai mara” and a lightly etched skull of a stylized wildebeest. A wood stock is basically a $300 upgrade from the basic black synthetic. Our test gun’s walnut had a good bit of figure in the stock and forend. If you like the feel and look of wood, it’s nice. If you are going to pitch the gun into the bottom of your duck boat or occasionally use it as a paddle, spend the $300 on extra decoys. As with most modern semi-autos, the stock has a set of six shims that makes it adjustable for cast and height. The pistol grip is a little more vertical than those on some field guns. The 7⁄8″ Cervellati recoil pad is made of special polyurethane microcell rubber. Checkering appears to be cut by laser and is quite uniform in a classically restrained pattern. Wood finish is a pleasant low-gloss oil. The outline of the forend is quite modernistic. It is somewhat higher in the middle than at the front and back for a different-but-pleasing look. Because the inertia action does not require pistons or action bars near the magazine tube, the forend is also quite slender. The Masai Mara kit consists of the gun, five chokes and wrench, stock shims, a snap cap, a bottle of oil, sling swivels, a five-year warranty handled by Briley, a manual with detailed instructions in eight languages and a plastic case that might survive the airlines. Setting up the gun initially was interesting. The barrel and forend are a little fiddly to put on unless you actually read the manual. There was a Retay sticker on the barrel that was the dickens to remove. But once the gun was together, it turned out to be really good looking, with pleasing lines, and to have a nice 7-pound weight and lively balance, with just a touch of weight bias up front, as it should. Inertia guns have the reputation of balking at light loads, but the Masai Mara worked perfectly with everything I tried, including factory 1-oz shells of modest velocity. While the gun’s 7-pound weight makes it nice to carry, that weight and the inertia action do produce some recoil. I would compare the kick to that of an over/under or pump of the same weight and say that it had a bit more recoil than a gas gun. A modest 1-oz load has about 20 foot-pounds of recoil in this gun, while a heavy 3″ shell can double that . . . and you will take notice. The gun’s handling was delightful. The modest weight and correct balance made it easy to shoot. The slender forend made the gun feel more subtle. It was light enough to move quickly on short shots, but the slight muzzle bias and 28″ barrel were at home on longer shots. Remember that a 28″ autoloader has the same sighting length as a 31″ O/U because of the longer receiver. One of the big advantages of the inertia action is that the gun shoots cleanly, because no carbon-laden gas is used to cycle the action. If you enjoy gun cleaning, have at it. But if, like me, Demon Sloth is one of your deities, this gun will not disappoint. Reliable, durable, attractive, clean, light, well balanced and priced right, Retay’s Masai Mara is a very nice inertia semi-auto. The Turks are coming for sure. For more information, contact Retay USA c/o Thomas Ferney & Co.